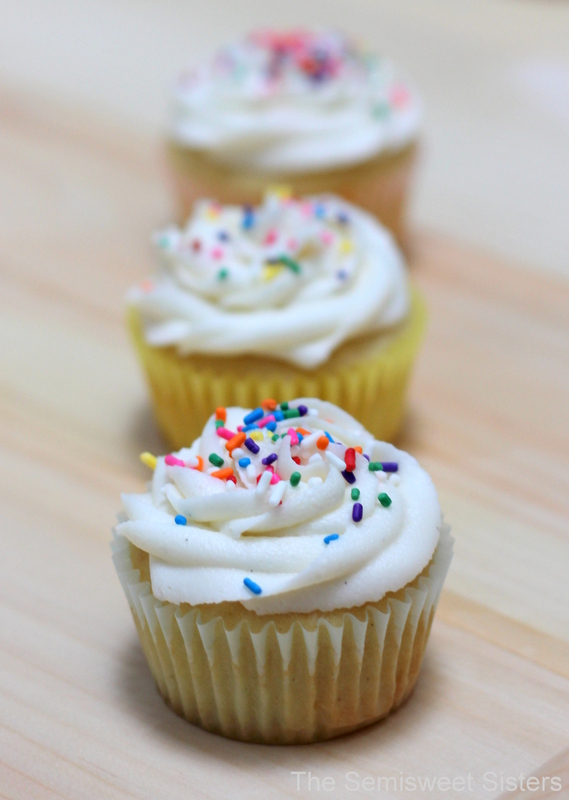 Light and moist vanilla cupcakes topped with vanilla buttercream frosting & sprinkles. For years I have searched and tried to find a vanilla cupcake recipe that I would like enough to make again and again. I think this recipe is a keeper because I’ve made it at least 25 times now. I didn’t realize I was so picky when it came to vanilla cupcakes but I truly am. I expect a vanilla cupcake to be light, moist, tasty, and full of vanilla flavor. This recipe sort of reminds me of store bought cupcakes but only in the good ways. I think that the sour cream is one of the secret ingredients that make this cupcake recipe so good! This recipe makes about 18 cupcakes. 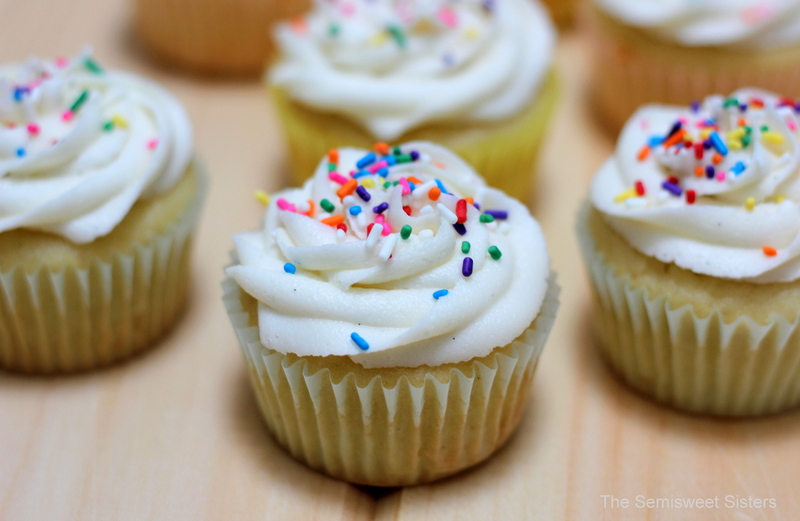 I usually use one cupcake pan that holds 12 cupcakes & one that holds 6 when I make these. Source: this recipe was adapted from cupcake project. Preheat the oven to 350 degrees. Line cupcake pan with paper liners. In a medium sized mixing bowl, combine flour, baking powder, baking soda, & salt & mix together. In another bowl cream sugar & butter together with electric mixer until light & fluffy. Add the creamed butter & sugar to the flour mixture & mix on medium-low speed for about a minute, you will end up with a crumb texture. Add eggs, oil, sour cream, & vanilla to the flour mixture & beat on medium speed until just combined. Slowly add in the milk on low speed until just combined. Fill cupcake liners ½ full. Bake for 14-16 minutes. Insert toothpick in center of a cupcake until it comes out clean or you can gently tap the top of the cupcake with your finger, if it springs back its done. Remove from oven & let cool in pan for a few minutes then move to a wire rack to finish cooling. FROSTING– To frost the cupcakes I used my favorite vanilla buttercream frosting recipe.